The beautiful community of Ft Myers Florida located in the southwestern part of Florida is a great place to kick back and enjoy a stroll on the beach, shopping, fantastic dining or one of the most famous estates in the United States. This estate which you will hear about later was by two pioneers of innovation that changed the face of industry in the last century. We passed through Ft Myers on our whirlwind tour of Florida in the Fall of 2007 and spent two nights camping at Koreshan State Park before heading to the Florida Keys. The most famous estate I mentioned earlier is the Edison Ford estate. We had been wanting to see the Thomas Edison and Henry Ford Estates for many years. I had also been in Florida for 40 years and had not been to the southwestern part of Florida including Naples, Ft Myers and had not been to the Keys either. Getting to see the Edison Estate was the highlight of a week long trip and many years of wondering what was in this part of Florida. Thomas Edison visited Ft Myers in 1885 when the town had a population of only 349 people. He liked what he saw so much that he decided to build a laboratory to perfect rubber for tires and a winter residence he named Seminole Lodge. Edison later sold several acres of his land to Henry Ford who built an estate right next door to Edison. Although Edison built quite a large estate and was always adding on to it by building and adding gardens, he and his wife only spent a few weeks a year here each year. The Edison Ford estate is well worth visiting and is the 9th most visited historic home in the United States. If camping is your forte then Koreshan State Park is a wonderfully tranquil retreat nestled in the scenic woods south of Ft Myers in Estero Florida. Although Koreshan was home to the Koreshan Unity cult the history behind the leader Cyrus Teed and the community he built here is fascinating. There is so much more to see and do in the Ft Myers area including fishing, boating, golfing, shopping, visiting the Fort Myers Historical Museum, taking in a play or the symphony or just relaxing at the campground or enjoying a day at one of the many beaches in the Fort Myers area. 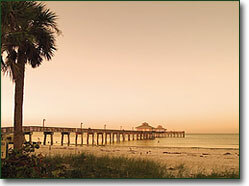 Click on the link below to find out more about staying in the Fort Myers area.